ww2dbaseAs the Japanese Army slowly moved across China, its strength became dispersed. To prevent the Japanese from gathering units into a force capable of mounting another major offensive, the Chinese launched a major offensive encompassing the entire China Proper. ww2dbaseOn 1 Dec 1939, the Chinese 3rd Army Group employed guerilla tactics behind Japanese lines and cut the Lung'hai Railway near Luowang, Neihuangi, and Lankao and also interfered with the highways at Tongxu, Huaiyang, and Luyi. Meanwhile, the Chinese 81st Division attacked Kaifeng and Lanfeng. Kaifeng was taken on 16 Dec after defeating a Japanese division stationed there. ww2dbaseTo the southeast, the Chinese 2nd Cavalry Corps encircled the Japanese position at Shangqui and destroyed Japanese aviation fuel stock nearby. ww2dbaseNorth of the Yellow River, the Chinese 36th Army Group defeated several Japanese mixed brigades near Anyang as they disrupted Japanese movement by destroying bridges. Nearby, on 13 Dec, the Chinese 47th Corps captured Taihang Mountain and cut the Taosin Railway by taking the stations at Poshan and Changkou. ww2dbaseThe 1st War Area inflicted 5,130 casualties against the Japanese and was generally successful in tying down Japanese forces in the region, therefore continuing to prevent the Japanese in concentrating at a single location to launch any major offensives. ww2dbaseOn 10 Dec 1939, an attack was mounted on Henglingguan Pass to the south of Jiangxian in northern China, successfully driving Japanese resistance out of the area by late Dec 1939. In response, the Japanese 37th Division counterattacked with 2,000 men from Yuncheng and Xiaxian, but could only achieve a costly stalemate on both sides. To the northeast, the 14th Army Group attacked Yicheng and Jiangxian in early Dec. On 15 Dec, a 5,000-strong Japanese force counterattacked with artillery and aircraft support, but it failed in preventing the Chinese from taking Longhua, immediately outside of Yicheng, on 18 Dec.
ww2dbaseIn eastern Shanxi Province, two Chinese corps attacked the Japanese 36th Division at Zhangzi and Changzhi on 13 Dec. Nearly encircled, the Japanese launched a strong 10,000-men counterattack on 1 Jan 1940. The Japanese counterattack was flanked between two Chinese forces two days later, and was forced to withdraw back toward Changzhi. The Chinese forces captured Licheng on 20 Jan, Dongyangguan Pass on 24 Jan, and Lucheng on 28 Jan.
ww2dbaseOverall, the efforts in the 2nd War Area, though apparently successful after inflicting 13,770 casualties on the Japanese forces, failed to seize the major towns on the railways, particularly the Tungpu Railroad (except for the area between Wenxi and Anyi). ww2dbaseOn 18 Dec 1939, the Chinese 6th Cavalry Corps and the Advance Force cut the railroad between Hohhot and Salqin. This prevented Japanese reinforcement from moving toward Baotou. At the same time, the Chinese 81st Corps attacked Dashetai. As Dashetai was taken on 19 Dec, the 101st Division of 81st Corps also moved further toward Baotou until encountering Japanese tanks. ww2dbaseFrom another direction, the Chinese 35th Corps attacked Baotou on 19 Dec, entering the city on the next day. After three days of house-to-house fighting, the Japanese were pushed to the southwestern corner of the city. ww2dbaseFrom Beiping, 2,000 Japanese troops arrived on 22 Dec 1939 with 200 trucks, 10 artillery pieces, 8 tanks, and 4 aircraft. This reinforcement force engaged in bitter battle with Chinese forces immediately and took heavy casualties. On 24 Dec, more reinforcements were called in, and finally pushed the Chinese into a defensive stance. By 28 Jan 1940, the Japanese were in control of the Baotou region and launched an offensive into the Wuyuan region in Inner Mongolia in early Feb.
ww2dbaseThe 8th War Area did not achieve their primary objective as they could not push back the Japanese troops at Baotou. However, the effort in doing so, particularly the drawing of more Japanese units into the region, achieved the goal of further dispersing Japanese strength in China. ww2dbasePenetrating deep into the Japanese rear area, elements of the Chinese 69th Corps and 6th Division supported local irregular guerilla forces in cutting communications at Baoding, Xingtai, Cangzhou, and Dezhou. This front of the overall Chinese operation was without decisive results. ww2dbaseIn late Dec 1939, elements of the Chinese 51st Corps sabotaged railways near Tai'an, Tengxian, and Chuzhou in the Shandong Province on the coast. As a response, the Japanese 21st Division, 32nd Division, 5th Independent Mixed Brigade, and Special Naval Landing Forces of the 3rd China Expeditionary Fleet were brought in to Shandong in Jan and Feb 1940. The Japanese reported capture or destruction of 20,000 Chinese troops during the counter-operation, which was a serious blow to this Chinese front. ww2dbaseThe 3rd War Area's operations began on 16 Dec 1939. While the Chinese 16th, 144th, 147th, 190th, and 10th Reserve Divisions all enjoyed success during the first two days of the battle, the 79th Division and the 50th Corps suffered heavy losses and were relieved on 20 Dec. On 23 Dec, Japanese reinforcements arrived along with aerial support, halting Chinese progress. On 28 Dec, after redeployment, a Chinese infantry regiment with artillery, engineer, and minelaying detachments penetrated Japanese lines and attacked enemy ships and released drifting mines onto the Yangtze River. ww2dbaseIn the southern regions of the 3rd War Area, the Chinese 10th Army Group took Hangzhou, Fuyang, and Yuhang of the coastal Zhejiang Province during the night of 13-14 Dec. The Japanese responded by sending forces to slow the advancing Chinese while a regiment of the Japanese 22nd Division counterattacked in two pincers south of Hangzhou on 21 Jan 1940. The smaller of the two pincers moved to Kanshan while the larger took Xiaoshan and continued to march eastward. Japanese troops broke through fierce Chinese defenses and pushed the Chinese back. ww2dbaseThe fighting in the 3rd War Area was able to disrupt communications and isolate Japanese 11th and 13th Armies, preventing them from linking up to counter the Chinese offensive. However, the Chinese troops failed to capture key towns on the Yangtze River to completely shutdown the Yangtze River to Japanese traffic. ww2dbaseThe offensive in the 9th War Area commenced on 12 Dec 1939 when the Chinese 50th and 60th Corps attacked towns surrounding Nanchang. Several Japanese divisions were dispatched to counter the Chinese advances beginning on 14 Dec, but between the start of the operation and the end of Dec 1939, the Chinese still managed to burn several Japanese warehouses and seriously disrupted Japanese transportation and communications in some areas. The Guangzhou (Canton)-Hangzhou Railway was disrupted at several locations as well. ww2dbaseOn 12 Dec 1939, Chinese 32nd and 40th Division attacked Qianjiang in the Hubei Province while the 128th Division attacked Xiantao. On the night of 15 Dec, the Chinese 4th Reserve Division crossed the Han River north of Shayang. By the next morning, several Japanese strong points were taken in the region. At dawn on 17 Dec, two Japanese columns, each 1,000-strong with tank support, reinforced Xiantao and Shayang. After bitter fighting, the Chinese forces prevailed, taking the two towns. On another front, the Right Flank Army's 12th and 33rd Army Groups attacked the south of Zhongxiang, capturing several towns and villages by the next day. In the Shaanxi Province, the Southern Henan Army launched an offensive on 12 Dec, attacking the Huashan Mountain region and Xinyang; actions there lasted through Jan 1940, with Chinese forces bolstered by units of the Northern Hubei Army. ww2dbaseOn 18 Dec 1939, a group of 600 Japanese personnel and 90 trucks was intercepted and destroyed by Chinese troops near Wangwutai. Some managed to escape. ww2dbaseOn 22 Dec, Chinese positions at Wangwutai and Lojiatang were attacked by 2,000 Japanese troops and 8 aircraft. The Chinese suffered heavy losses during the attack. ww2dbaseBetween 23 and 31 Dec 1939, the Chinese forces consolidated and withdrew west of the Han River. However, some fighting continued. On 11 Jan 1940, a Japanese truck convoy was intercepted; a Japanese colonel was killed in the action while large amounts of supplies were captured by the Chinese. ww2dbaseBack on the Right Flank Army's front, the Japanese reinforced the Zhongxiang area, and by 26 Dec Japanese strength there was increased to 5,000 men, 10 artillery pieces, and 20 tanks. The Japanese attacked on 27 Dec, pushing the Chinese back to Changshoudian by 28 Dec, requiring Chinese reserves to be engaged in order to stop the Japanese momentum. By 31 Dec, the Chinese held the line from Pumenchung to Paimiaochang. ww2dbaseOn 5 Jan 1940, Japanese troops captured Wangdian from the Chinese 29th Army Group, but a counterattack by the Chinese 55th Division recovered the town the next day. Between 9 and 13 Jan, Japanese troops attacked the Right Flank Army but only to result in a stalemate with high casualties on both sides. ww2dbaseAlthough this front caused serious casualties on the Japanese, the primary objective of tying down Japanese troops in the specified region was not achieved. ww2dbaseIn mid-Nov 1939, Admiral Nobutake Kondo's 5th Fleet sailed to the southern Chinese coast off Guangxi Province, escorting 50,000 Japanese troops consisted of the 5th Division, part of the 18th Division, Guards Mixed Brigade, and the Taiwan Mixed Brigade under the command of Lieutenant General Seiichi Kuno. The troops landed and captured the city of Nanning, the provincial capital. This represented the next step in the Japanese attempt to blockade the entire Chinese coast, cutting off any sea-bound supplies from the Chinese Army which had been gradually pushed inland. ww2dbaseTo counter the Japanese occupation of Guangxi, the Chinese 200th Division, Nationalist Chinese's first and only mechanized division, reinforced the two weak army groups already present and attacked Kunlun Pass near Nanning on 18 Dec 1939. The Chinese attacked the Japanese brigade that garrisoned the pass, attacking in such ferocity that even great casualty numbers did not turn them back. At a high cost of almost 27,000 casualties, the Chinese effectively wiped out the entire Japanese brigade as an effective force by 11 Jan 1940.
ww2dbaseAt the same time, an attack was launched at the Guangzhou (Canton)-Kowloon Railway. It was then the Japanese realized that the Chinese attacks in Guangxi were not purely a counterattack against Japanese landings, but rather a part of the overall country-wide offensive. The Chinese 12th Army Group attacked the Guangzhou region. The town of Longxian was under Chinese control on 2 Jan 1940, Guandu on 4 Jan, and Qingtang and Yingde on 5 Jan. The battles in this region became rather a stalemate as well, with front lines swaying back and forth for the following year. Like some of the other war areas, although the offensive in Guangdong and Guangxi inflicted serious casualties (again, at a high cost to the Chinese as well), Japanese troops continued to retain the ability to shift forces from region to region, therefore rendering the primary Chinese objective a failure. ww2dbaseIt is notable that Japanese occupation in this southern China region became largely unnecessary after the completion of the French Indochina occupation operation, which began on 23 Jul 1940 and ended some time in Sep 1940. As a result, in Nov 1940, the bulk of Japanese forces withdrew from Guangxi. ww2dbaseEach War Area, as divided by the Chinese military, achieved various degrees of success. Looking across the entire offensive, however, the Chinese had not achieved the overall strategic objective of preventing the Japanese from shifting forces from one War Area to another, therefore strategically the offensive could only be deemed as a failure. However, when considering Japan's involvement in WW2 instead of only focusing on the Second Sino-Japanese War, the Winter Offensive contributed greatly to the Allied cause. The Winter Offensive became the start of a long occupation of China that tied down many Japanese divisions in the vast country. Consequences would later become more evident when the men garrisoned in China could also have been used in the Pacific Theater. 1 Dec 1939 Chinese 3rd Army Group cut the Lung'hai Railway line at several locations and attacked highways, both actions interrupted Japanese logistics. Meanwhile, troops of the Chinese 81st Division attacked the cities of Kaifeng and Lanfeng. 10 Dec 1939 Chinese troops launched an attack on Henglingguan Pass south of Jiangxian in northern China; the Japanese troops at the strong point would be driven off by the month's end. 13 Dec 1939 In China, troops of the Chinese 47th Corps captured the Taihang Mountain and cut the Taosin Railway by taking the stations at Poshan and Changkou. Chinese troops launched an offensive in eastern Shanxi Province in China, nearly encircling the Japanese 36th Division. 15 Dec 1939 5,000 Japanese troops launched a counter-attack against recent Chinese offensives in northern China. 16 Dec 1939 In China, troops of the Chinese 81st Division captured the city of Kaifeng in Henan Province, while troops of the Chinese 5th Division began to advance toward Kunlun Pass, Guangxi Province in southern China. 18 Dec 1939 Chinese troops captured Longhua, near Yicheng, Hubei Province, China. 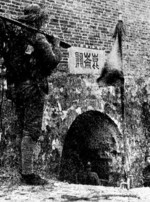 To the south, Chinese 5th Division captured Kunlunguan Pass in Guangxi Province. 19 Dec 1939 Japanese troops captured Kunlun Pass 59 kilometers northeast of Nanning, Guangxi Province, China. 31 Dec 1939 Chinese declared victory at Kunlun Pass 59 kilometers northeast of Nanning, Guangxi Province, China, although the remnants of Japanese troops trapped in the region would not capitulate until mid-Jan 1940. 1 Jan 1940 10,000 Japanese troops launched a counter-attack in eastern Shanxi Province in China in an attempt to relieve the nearly-surrounded Japanese 36th Division. It would be driven back by stiff Chinese resistance within the next two days. 20 Jan 1940 Chinese troops captured Licheng, Shanxi Province, China. 24 Jan 1940 Chinese troops captured Dongyangguan Pass, Shanxi Province, China. 28 Jan 1940 Chinese troops captured Lucheng, Shanxi Province, China. My ancestors come from Yingde Qingtang - according to some of the elders who are still living there - during the war, the entire village - the Lam Village - would have to hide in one of the caves in the stony hills in the region. I visited those caves yesterday...very interesting. is there anything that's posted for my report about japanese offensive or is it the same with world war two?